Are there books of the Bible you have never read? Do you have a little confusion over which prophet did what? Wouldn’t you like to know more about God’s Word? Wouldn’t you like to strengthen your relationship with Him? As the New Year of 2013 is just around the corner, I want to challenge you to join me in reading the Bible cover to cover this year. That’s right! I’m going to start on January 1, 2013 and I want you to join me! I have a reading plan posted to this page, so all you need to do is print off the reading plan, get a good study Bible and set aside daily time to dig deeper into God’s Word! Maybe you have thought about doing this before but didn’t think you had the time. I want to encourage you, my friend, that now is the time! Don’t delay! I can tell you from experience that when you read the Bible cover to cover, you will discover truths from God’s Word that you never knew and you will grow closer to Him in a way like never before. God tells us to meditate on His Word day and night….this is a great way to get started! This challenge is not for the faint of heart. It will take focus. It will take discipline. It will take sacrifice, but there is nothing more deserving of our time than spending it in God’s Word. 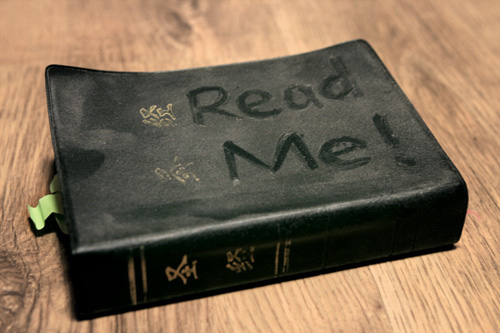 Each day you will spend 15-30 minutes reading a section of scripture and learning more about God’s love for you. If you want to join me in this challenge, go to the Joytime Ministries Facebook page and click “like” under the posting about this challenge, or leave a comment below this post. I will be posting thoughts to my blog along our journey and I want to hear from you! Are you ready to know more about the God of the Universe? Are you ready to commit the time to seek Him on a deeper level? Get ready! Get set! I can hardly wait!! Thanks for challenging us. I had already committed to myself to read through the Bible chronologically next year. Hoping I can stay committed to it! !